Hello there, Suhana Khan. What a pretty smile! A picture of Shah Rukh Khan and Gauri's 18-year-old daughter Suhana is doing the rounds on social media and her smile will surely make your day. Often, some of Suhana's fabulous pictures take over the Internet. Fan clubs have now shared a picture of her which appears to be taken during one of her outing with friends. Suhana looks chic in a light purple outfit, which she had teamed with a denim jacket. She poses with for the photo with a bright smile. Her picture has certainly sent the Internet into a meltdown. 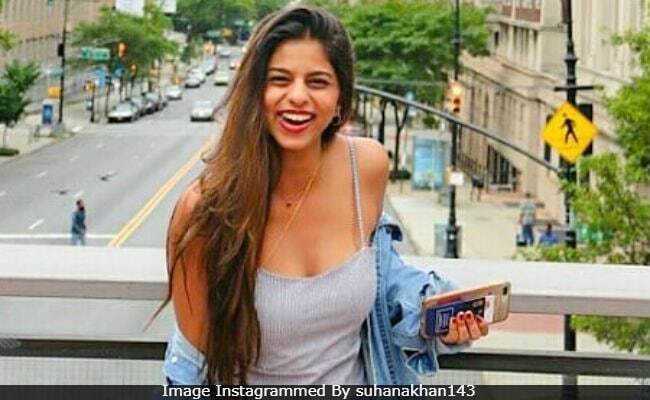 "So stunning" and "what a beautiful smile, Suhana," are some of the comments posted on the viral picture. Baby @suhanakhan2 why so gorgeous!! Another picture of Suhana partying with her friends has also been shared. Suhana is Gauri and SRK's middle child. She is completing her final term at Engalnd's Ardingly College. Their elder son Aryan, 20, studies films in California while little AbRam, 5, stays with his parents in Mumbai. SRK took his family to Europe some months ago and we were treated to some beautiful pictures from the trip. She also accompanied mom Gauri to Shweta Bachchan Nanda's label launch. In her first interview to Vogue, Suhana also talked about her dream of becoming an actor. "I don't think there was any one moment when I decided. Since I was young, I'd do all these accents and impressions. But my parents only realised I was serious about acting when they saw a performance of mine for the first time. I was playing Miranda in a school performance of The Tempest," she said.